The metamorphosis of La Cumbre Plaza is a success story that employs many of the components already described under ‘Downtowns from Nowhere’. A few years ago, the shopping plaza was an outdated and rather typical 60s style uniform outdoor mall with a tired look buildings and a dwindling customer base. The design challenge was to create a shopping environment that could attract new customers, could compete with the downtown shopping, and could become a self refreshing environment that would remain attractive; and this needed to be accomplished with only minimal capital input by the landlord. The design team decided to return the mall to a quasi ‘main street’ environment by imposing a new set of design rules on the center that would oblige new tenants to treat their storefront as if it was their own building façade on their own structures. The design of the new facades was guided very much like it is in most successful real downtowns: there were minimum and maximum height rules, canopy rules, rules about materials, roof configurations, signage and the amount of glazing. But the dialogue between different buildings that is the essence of successful downtown environments had to be jumpstarted. 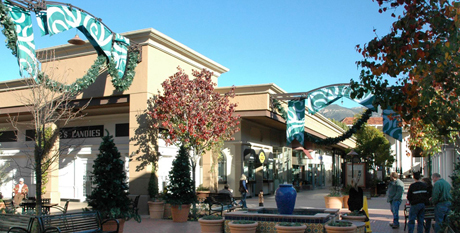 This was accomplished when the landlord agreed to renovate several buildings in the plaza’s key locations, based on an overall urban game scenario and a time scaled master plan for the plaza. This urban ‘starter culture’ provided the ingredients new tenants could then respond to in their own buildings. And how it worked! Today, La Cumbre Plaza is nearly built out, and the transformation is startling. Instead of a uniform and dated mall, the plaza feels again like a part of a lively and pleasant commercial downtown. The different new building facades naturally orient visitors with individually different shopping streets and plazas. The center has many new high end tenants and offers several eateries scattered throughout. And since the transformation is inherently ongoing, these changes will provide a lively and varied environment that will grow and change for many years to come.